Home Lifestyle Fashion Add this bag to your collection to stand out from the crowd! Haven't we all always wanted a bag that not only serves all our needs but makes us stand out from the crowd as well? 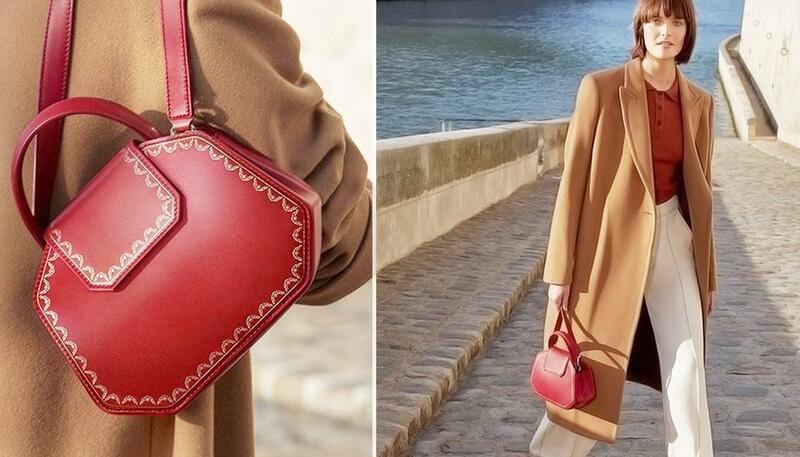 Cartier which is famous for its exquisite jewellery and elegant watches has now come up with a beautiful, versatile and luxurious looking bag unlike any other currently available on the market, reported L'officiel. The handbag unveiled by Cartier, which is inspired by its iconic jewellery boxes is ideal for everyone with a unique touch of the post- Christmas blues, or for anyone who is on a hunt for the new season accessory. The Guirland De Cartier handbag, much like Cartier's jewellery cases, stands out from all the others with its unique features: a geometric form made up of 8 clean-cut sides, put together with smooth calfskin leather in rich colours of red, green or black, giving the perfect holiday season feels! And not to forget, the bag's facade which is embellished with a gold frieze trimming that gives it a stunning and regal touch. Making it more useful and customer friendly, the handbag also comes with an adjustable and detachable leather strap, leaving it on people to decide how they want to flaunt the bag. One can sling it over the shoulder or wear it as a clutch, depending on one's plans for the day and the rest of their outfit. Spirit of the Maison, encapsulated: Introducing the new #GuirlandedeCartier bag. Available now exclusively in 3 Cartier flagship stores: 13 rue de la Paix in Paris, New Bond Street in London and 5th Avenue in New York. The bag will be available in Cartier boutiques and online from January 2019. Keeping in mind the varied need of consumers, the collection showcases three sizes: mini, small and medium. Cartier has earlier launched jewellery bags in the 1910s and clutch bags in the 1960s but this is their very fast everyday accessory. The Guirland De Cartier handbag fuses the aesthetics of jewellery and watches that the company is traditionally known for and merges them into one beautiful bag. The Cartier handbag will be available in Cartier stores from March.